Heraldry: Wearable Heraldry ... It’s Everywhere! I thought I’d share with you some of the wearable heraldry I’ve run across and purchased over the years. Most of it I actually found “in situ”; that is, I got in at the location, and didn’t buy it over the internet. And, of course, sometimes just putting on and wearing one or another of these tee shirts, or “gimme caps,” brings back memories of the times and places I was there. What we have here are two tee shirts with the arms of educational institutions. On the left, the University of Ottawa in Canada, on the right, Trinity College in Dublin, Ireland. 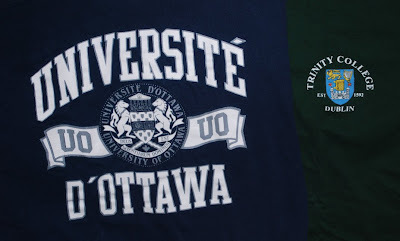 I picked up the UO tee shirt while attending my first International Congress of Genealogical and Heraldic Sciences, held on the campus of the university in 1996. It was a really great introduction to the Congresses, and I’ve managed to attend every one of them since that time. (Though apparently I did cause a bit of a stir among some of the European attendees, by not taking off my cowboy hat upon entering the building, waiting for that until I had reached the lecture room(s). My thought was, well, I’ve got my camera in one hand, the Congress canvas bag with papers, etc. in the other, where was I to put my hat to carry it about? So I left it on my head until I reached my destination and sat down. But apparently this was something which is “not done” on the other side of the Atlantic, and in my travels there I’ve tried to be much more careful so as not to offend.) This Congress was also my introduction to some of the luminaries of the heraldic world: Rob Watt, the Chief Herald of Canada, Frederick Brownell, then State Herald of South Africa, Charles Burnett, Ross Herald of the Lyon Court in Scotland, Henry Bedingfield, York Herald of the College of Arms in London, and a whole lot of others, many of whom have become good friends over the years. The Trinity College shirt was purchased in the gift shop just across the way from where we were lodging while attending the International Congress held in Dublin in 2002. (This is the same gift shop that is also the entrance to the Book of Kells exhibit and also, which I found even more impressive, the “Long Room”, the long, barrel-arched room, two stories high, that contains all of the oldest books in the Trinity College Library.) We were lodged just across the square at Trinity College in the dorms known as Botany Bay. (And the entire time we were there, I kept hearing Chekov’s voice in my head: “Botany Bay? Botany Bay! Captain, we must get out of here!”) And I also learned that you really need very thick-soled shoes if you’re going to spend much time walking across the “hallowed cobblestones” of the College; they’re pretty hard to walk on, and will really make your feet hurt if you’re not used to them.